Thanks very much to the Savannah Jaycees for hosting the mayoral forum on Monday night, and thanks to WTOC for streaming it live and posting the embeddable video that you can watch here. 1. 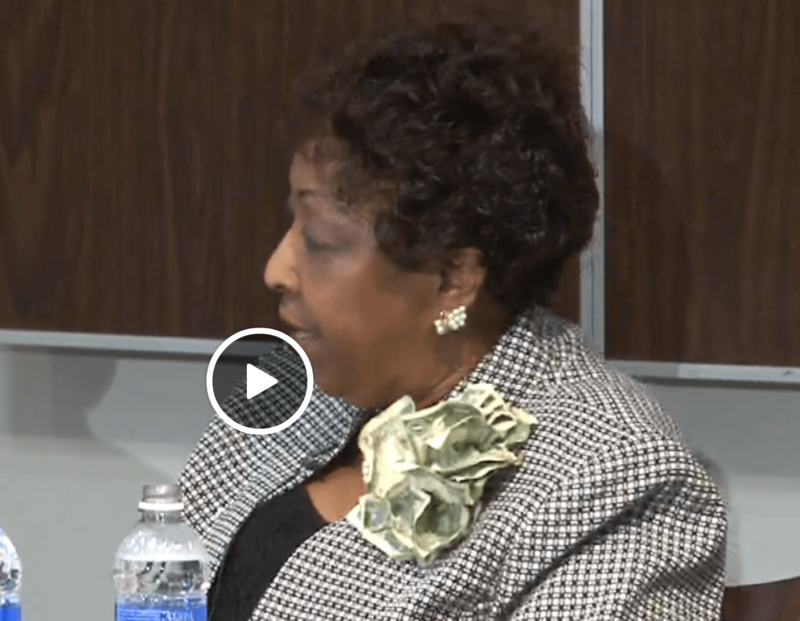 The format certainly forced all four candidates — incumbent Edna Jackson and challengers Eddie DeLoach, Murray Silver, and Louis Wilson — to answer questions succinctly. 2. There were no winners, and therefore Jackson was the winner by default. She enters the race with some significant advantages, and the challengers will have to do a better job of tying her and her policies to problems now plaguing the city. Jackson explained the history and symbolism at the 57-minute mark in the video below, but I still don’t know quite get it. Some young men in West Savannah gave her dollar bills because a suspect was killed in police custody on her birthday? And now she is in the planning stages for some sort of dialogue with those young men? If she wants to talk to them about their lives, why has that taken a year? Is she still in touch with them? Or is she planning some sort of more general dialogue with young people about the problems they face? And that dialogue will somehow help us understand our crime problem? 4. The format included a large panel of media questioners, and the sheer number of panelists precluded any clear logical progression to the questions. The panelists and later the moderator asked all the candidates the exact same questions, which might seem a fair process at first, but the challengers need to be asked different questions than one would ask the incumbent. 5. No one asked about certain policy specifics. What about the rewrite of the alcohol ordinance and issues like the expansion of the to-go cup zone? What about the NewZO — the new zoning ordinance that has been in the works for a decade? What about the food truck ordinance, the first draft of which is far too restrictive? What about the work of the City Manager and her office? What about the future of the current arena site? What about traffic calming, bicycling, pedestrianism? What about Waters Avenue and the many years of failed policy decisions there? What about the I-16 flyover? I’m pretty sure I’ve watched the entire debate embedded here, and I didn’t hear anything about any of those. 6. Also, it was disappointing to hear questions about how to increase filmmaking and tourism. Both of those sectors are booming. 7. Murray Silver brought up the possibility of making Savannah a high-tech hub, but none of the other candidates talked about Savannah’s potential as a creative enclave of the 21st century. Disappointing. 8. Asked about city-county consolidation (which I oppose for reasons I’ll likely write about sometime soon), the mayor cited the difficulty in finalizing the decade-old police merger. Huh? If we had a consolidated government, the police merger would have been over and done with, years ago. We wouldn’t have two separate governments wrangling over details — costly details — if there were only one government involved. This surely wasn’t the first time Jackson had heard a question about merging the city and county governments, and that makes her response even more mystifying. 9. Jackson also expressed her support for commercial recycling (right now of course we only have residential recycling). Well, Jackson is the mayor, and has been mayor for almost 4 years. If she thinks that commercial recycling is a good idea, shouldn’t plans for that be in the works? And shouldn’t she have told us the status of those plans? Those are just a few quick thoughts. Feel free to share yours in the comments here, but I won’t approve comments that have no other point than to make personal attacks. I’m sure some people will also comment on the Savannah Unplugged Facebook page, and I hope I don’t have to police personal attacks there either. If you want to rant, there are plenty of sites where you can do that. The brooch came about when she went back to Augusta Avenue on the one year anniversary of the shooting of the young black man by a Policeman. After the shooting, against the advice of the police, Edna went to the neighborhood and pledged a fair investigation. She circumvented any violent reactions that were happening in other parts of the country. She had committed to the community that she would not forget the people there. Most people thought she would not show up on the one year anniversary since it was her birthday. She did show up and one of the young men, who had no job and would be termed “at risk” by some standards, was so moved that he gave her a dollar, which he really could not afford. That was followed by many other young men doing the same. Edna was so touched that she made a corsage of the bills so she could keep those young men’s struggles close to her heart. That being said Edna will no longer be wearing the corsage, but she will not forget about her pledge to help those young men. From now on, the only place to see her corsage will at the Re-Elect Edna Jackson Facebook Page. All very good questions, and like you I would love to hear the answers.